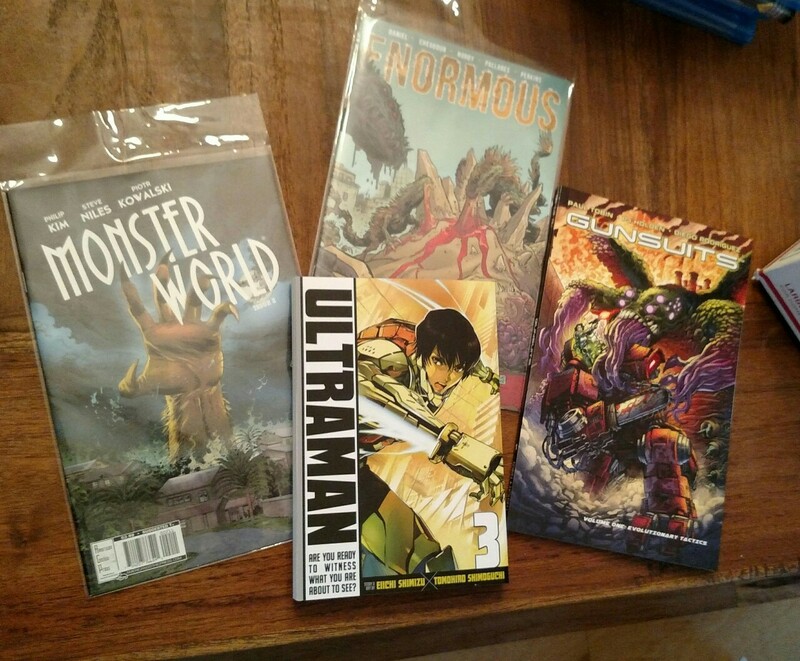 SciFiJapan is reporting that Viz is bringing over the newish Ultraman manga. Looks and sounds interesting. The Ultraman design on the cover looks great, too. I'll be checking this out. Caleb Goellner wrote: If you had to compare Tsuburaya’s Ultraman to a Western superhero concept, the closest comparison would probably be… Captain Marvel or a much friendlier version of Alan Moore’s Marvelman? Every incarnation of the longrunning Japanese tokusatsu and anime empire is different, but more often than not, the hero is the result of a nobel member of a kind of cosmic pantheon merging with a human host (or taking on a human form) to defend planet Earth from invading kaiju from space. 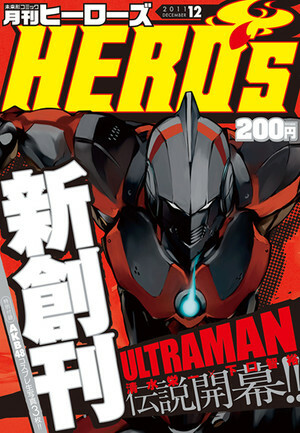 In Japan’s Monthly Hero’s Magazine, however, manga creators Eiichi Shimizu and Tomohiro Shimoguchi present a normal human donning a special high tech suit to protect the planet as Ultraman. As seen in a new motion comic video promoting the series’ third collected volume, ordinary teen Shinjiro Hayata dons a high tech “Ultra Suit” created by his father Shin Hayata — the original human host for Ultraman — to covertly combat threats as part of a secret organization. In this continuity, it’s been around 40 years since the original Ultraman left Earth. When new monsters attack, it’s up to Shinjioro to face the new foes as he’s the only one with a bloodline that’s compatible with the armored suit, which channels energies unique to Ultraman and other beings from the Land of Light. And don’t worry, the suit of armor isn’t like Iron Man’s where it’s just a normal dude inside some metal shooting repulsor blasts. This suit sees Shinjiro do all the usual Ultra stuff, like growing to a height of several stories and blasting evil with the hero’s signature Ultra Beam/Specium Ray. The manga has been around since 2011, but with the book’s plot and backstory established, the latest collected volume that arrives in Japan in September cuts straight to action with Ultraman taking on a new alien monster. Overall the series is darker in tone and more targeted to teens and adults than the more kid-friendly Ultraman Ginga, Tsuburaya Productions’ latest live action show. Created to celebrate the company’s 50th anniversary, Ginga follows a protagonist who essentially saves/teams up with every other version of Ultraman after they’re turned into action figures by mysterious force. No word on whether this manga will make its way to North America. Harvey released its own original Ultraman comic that ran for eight issues in 1993-94, with Viz releasing some translated Battle of the Ultra-Brothers manga around the same time. The last Ultraman comic released in the US was Dark Horse’s 12-issue adaptation of Ultraman Tiga from 2003-2004. VIZ Media To Debut New Ultraman Manga Inspired By Classic Japanese Superhero This August! I'm very happy to hear this. I was reading fan translations of the manga, but those have stopped short. It's great that we're getting an official release now. Skimmed through this at the bookstore and it looks interesting. I've only familiar with the first Ultra series and this seems to be a direct sequel to it, so I think I can jump right in. I'd love to support officially licensed Ultra merchandise but can anyone say it's worth keeping up with? I've been meaning to read more manga, I've only ever read Akira and the Evangelion adaptation. It does keep the original Ultraman series as cannon, so there are characters and references to that. There is young protagonist (so we're very squarely in shonen territory) who has super powers (they call it "The Ultraman Factor").. there are also villainous aliens. The action so far is all human sized (with armored power suits) but the short flashbacks to the original Ultraman has large scale monsters. I liked it quite a bit. The action did remind me more of The Guyver than of Ultraman, but I have a good feeling that the manga is building up to more traditional Ultra action, so I don't feel too disappointed yet. I liked the artwork, enjoyed the ties to the original show, and look forward to Volume 2.
guess who hosted a panel about this comic at this years "Comic Con" in San Diego? It's a neat read, and it touches on how the manga compares/contrasts to both classic Ultraman and American superheroes. My volume 2 was printed upside down. Is that happening widely? ^I looked through a copy at my comic shop the other day and yes: printed upside down. My copy is printed fine. Say, shouldn't we be getting volume 3 soon? My volume 3 already arrived last week. It's on my Amazon wish list to be released 2/16/16 (in about 11 days), but I suppose some distributors could have shipped it early. interesting.... Viz's website has the 16-Feb release listed as well, and it isnt available via digital yet either. I was just thinking: with the anime adaptation of this series coming to Netflix it'd be cool if Viz published some other Ultraman manga. For instance, you could publish the Ultraman The First manga from '00s (done by the guy who did 3x3 Eyes) which retells the original show and market it as a prequel to the main manga series.